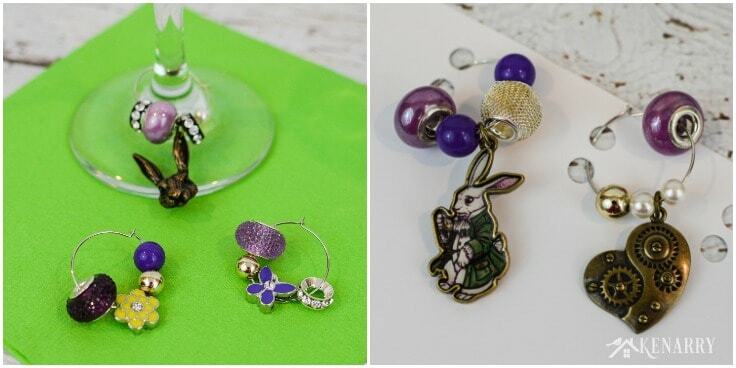 Learn how to make Easter wine charms as a DIY gift for friends and neighbors. 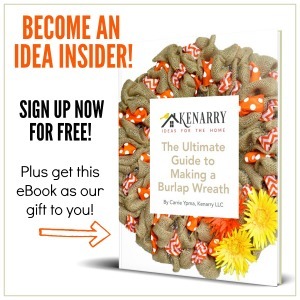 This super easy craft idea is the perfect hostess gift for spring. Hey there! Today I’m going to show you how to make Easter wine charms. 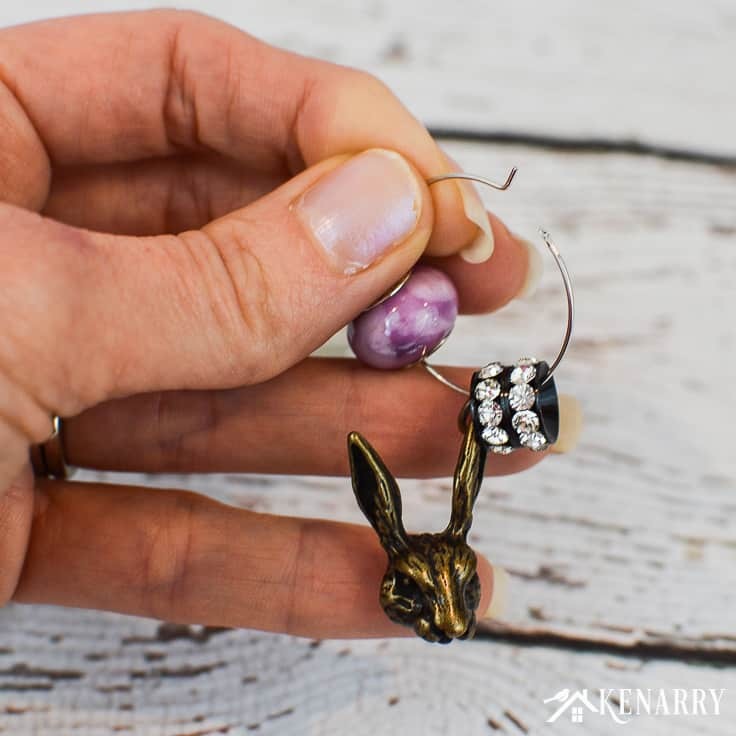 While I created this craft idea as an Easter hostess gift, these cute little baubles are also great as a DIY gift for friends and neighbors anytime. We have so many special family traditions for Easter, but at the center of them all are my Aunt Ronda and Uncle Bob. They go above and beyond every year to make it a fun, memory making event for my huge extended family. Because they (along with their daughter Jessica) are such amazing hosts, we always look for a unique way to thank them and let them know how much we appreciate all the time and effort they put into our Easter festivities. The year before last, we made each of them an Easter burlap wreath. Aunt Ronda’s wreath had wide purple ribbon (her favorite color). Whereas Jessica’s was pink and lime green with an Easter bunny climbing through the center of the burlap wreath. During the big ham dinner that year however, we noticed Aunt Ronda was using Christmas wine charms on the wine glasses. So I knew Easter wine charms or glass markers would be the perfect thank you gifts for Aunt Ronda and Jessica the following year. Making your own Easter wine charms is super easy. 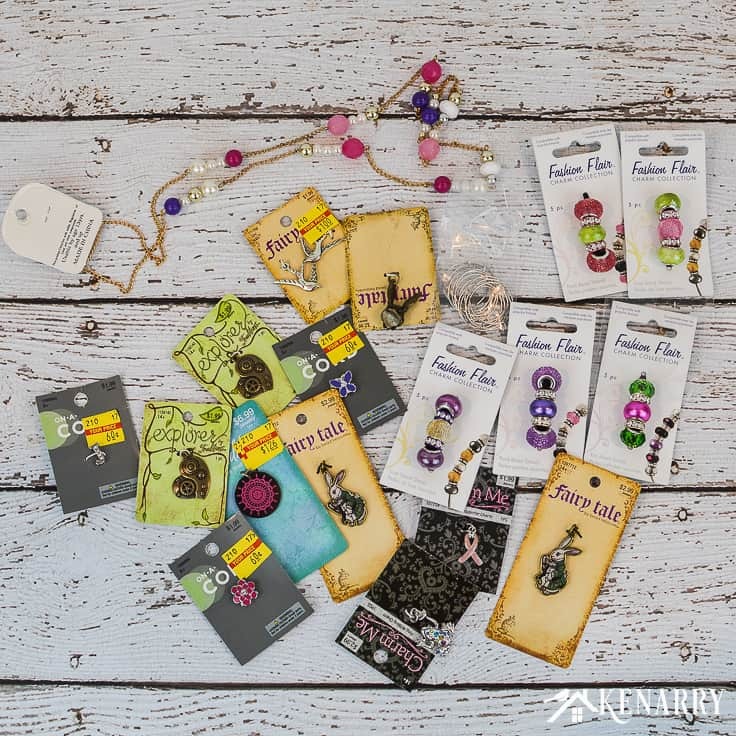 You just need to hunt for spring or Easter themed charms and beads in the jewelry making aisle of your local hobby and craft retailer. It’s also great to look and see if your dollar store carries jewelry making craft supplies. Plus if all else fails you can buy spring themed charms online at Amazon. 1. Determine your bead and charm combos. Remove all of your beads and charms from their original packaging and set them out on your work surface so you can see what your options are. Among all the baubles, I had some colorful beaded necklaces that I found at our dollar store. I used needle nose pliers with a wire cutter to dismantle the necklaces so all I had left were the beads. Next I grouped them by color and by type. Because my Aunt Ronda’s favorite color is purple I wanted all shades of lavender and violet for her Easter wine charms. I set aside all the pink and green ones for my cousin Jessica’s set. 2. String the beads and charms on to the metal hoops. Next open one of the earring hoops or wine charm rings. Carefully string 3-5 baubles on to the hoop. For each of the Easter wine charms, I wanted to have at least one dangling charm and a few different beads. 3. Repeat the process for your remaining Easter Wine Charms. 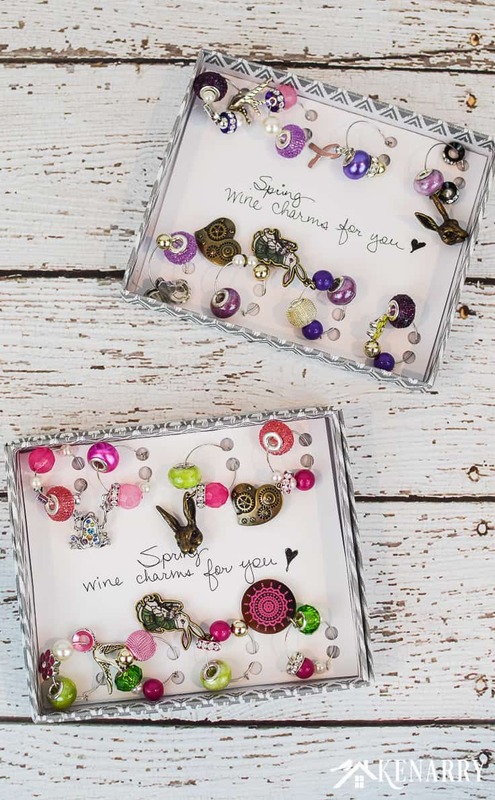 Keep filling wire rings with beads and charms until you’ve created complete sets of Easter Wine Charms that coordinate. Yet make sure the combo of beads on each wine charm is unique and distinct from the others in the set. After all, the entire point of wine charms is to help people keep track of which wine glass is theirs at a party. 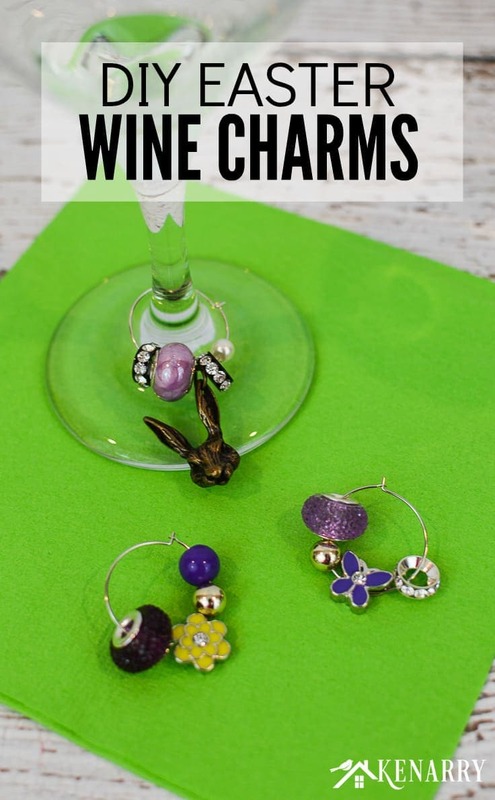 It may help to test out your Easter wine charms with a wine glass. For example, are the wine charms too heavy or too full? Are the beads sliding off when you try to wrap the wine charm around the stem of the wine glass? Make adjustments as necessary. For each set of glass markers, I made eight Easter wine charms. As I mentioned earlier, the purple set above was for Aunt Ronda. This pretty pink and green set was for my cousin Jessica. You might notice that I used a few of the same dangling charms on both sets. That doesn’t matter as long as the colors around it are totally different. Small, flat gift boxes – the specific ones I used aren’t available online, but these kraft paper gift boxes are the same size. 1. Trim the card stock to fit in the gift box. 2. Create holes to attach the wine charms to the card stock. Use a single hole punch to create two holes for each wine charm, evenly spaced around the outside of the card stock. Loop the Easter wine charms through the holes and close the hoop so they don’t slide off. 3. Label the wine charms in the boxes. 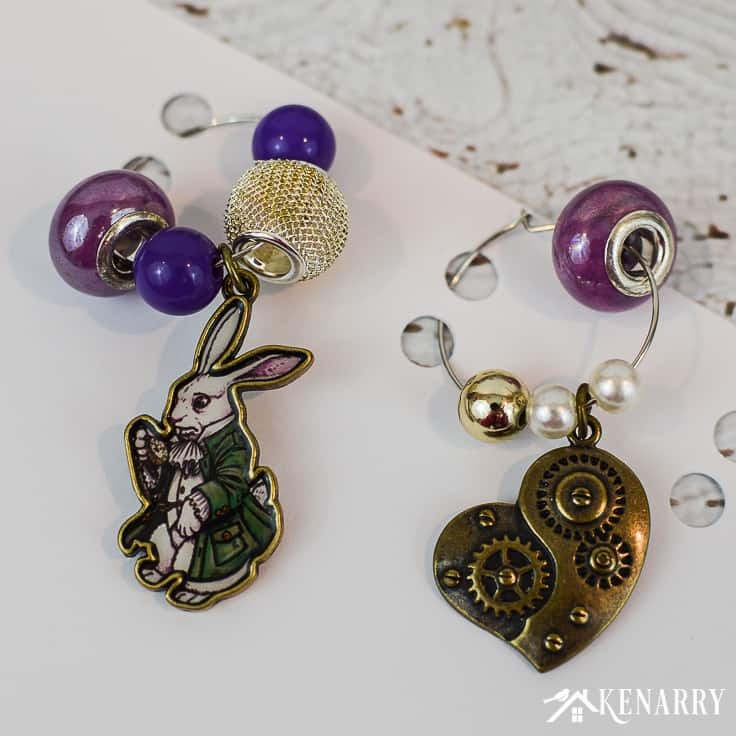 Use a gel pen or marker to write on the card stock so your recipient knows instantly when she opens them that these are Easter Wine Charms. You definitely do not want her to think these are funky, heavy earrings! LOL! 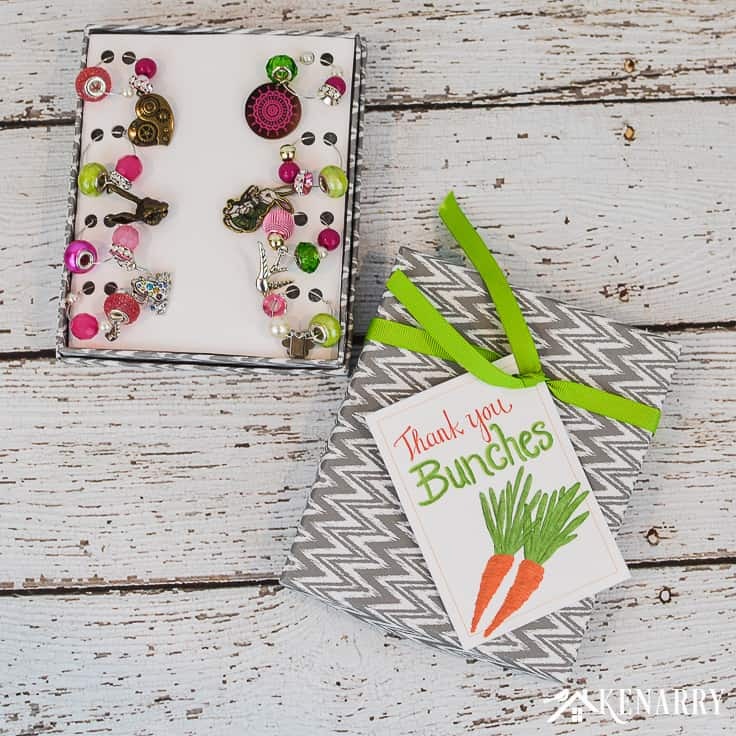 Then insert the cards filled with Easter Wine Charms into the gift boxes. 4. Attach the thank you tags. Close the boxes and tie a pretty ribbon around them. 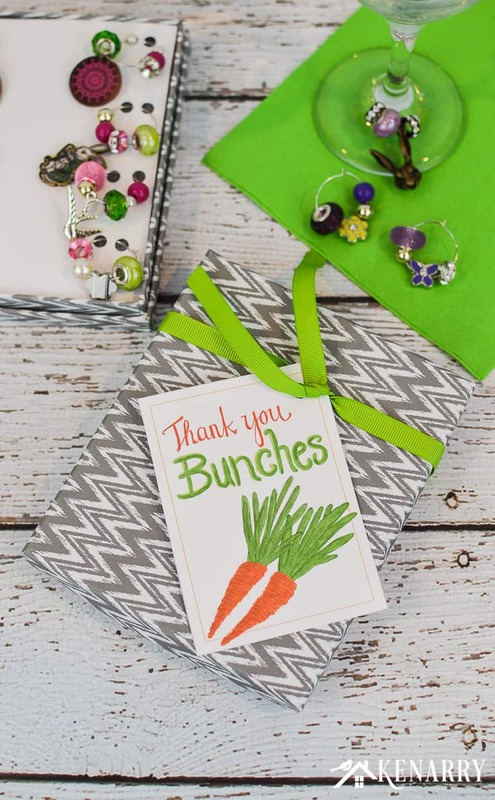 Then attach a personal note card or thank you tag to let your hostess know how much you appreciate her! Get the free printable Spring Thank You Cards. If you like the “thank you bunches” tags I used on these gifts, they’re available as a FREE gift when you sign up below! Then you just need to download the PDF file and save it to your computer. 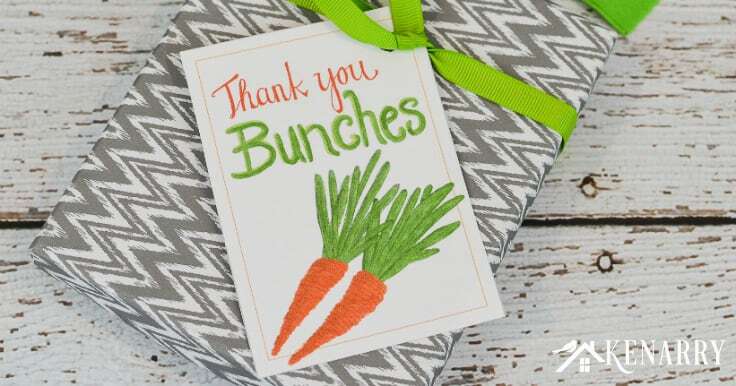 The Spring Thank You Cards and all other free printables from Ideas for the Home by Kenarry™ are for your own PERSONAL USE ONLY. Once you have the file, print the Spring Thank You Cards in color on white card stock.